A Bovis Homes site manager in Cheshire has won a prestigious award for the highest standards in house building for the second year in a row. 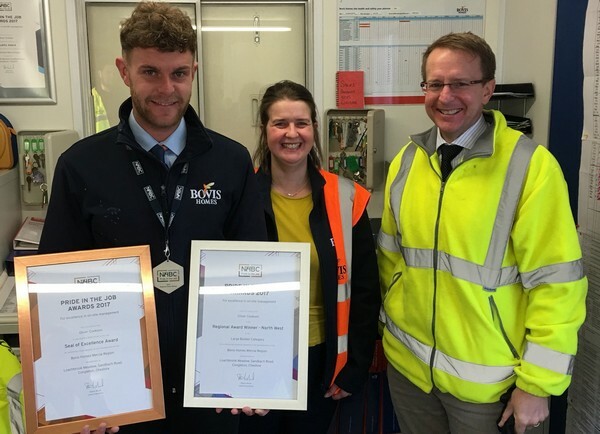 Oliver Cookson is celebrating recognition for his excellence in on-site management once again at Loachbrook Meadow, on the outskirts of Congleton. He picked up the gong in the North West region of the National House Building Council's (NHBC) Pride in the Job Awards 2018, being one of those selected for a Quality award from more than 16,000 site managers from across the country. Oliver, who lives in Middlewich, also won a Quality award last year en route to being named the best site manager in the whole North West region in the large house builder category. The double achievement highlights Bovis Homes' commitment to recruiting the best site managers and focusing on build quality in Cheshire and the rest of its Mercia region. Oliver said: “It's great recognition for all the team here and everyone on the site is so excited. It's due to the organisation of the trades and the fact that everyone really cares about what we do. It's a massive team effort. Oliver will now go on to compete for one of the Seal of Excellence and Regional Winner titles, the winners of which will be announced on 12th October. Joanne Morrison, managing director of Bovis Homes' Mercia region, said: “This is a fantastic result for the team and the region. It is clear every day how much effort they put into the site and this award is well-deserved recognition of that.